A special post by my partner in crime & co-head of The Cleverness: Dr Kim Lam (aka the dangerlam). What might be different about the year ahead? More so than any other event we've ever been to or produced, Percolate came with a distinct sense of ichi-go, ichi-e (一期一会)—a Japanese idiom originating from tea ceremony. It describes the concept of 'one time, one meeting, one gathering, one chance’. And is a reminder to maximally extract from the moment and really be in it, because it also means ‘never again’. It’s a true point for Percolate, which unfolded into such a sensory, thought-experimental and conversation-rich occasion, that you had to be there. The main event was held in a Fitzroy warehouse conversion, mid one of the most bustling streets on the world hipster map. The air was twice-laced with drinkable aromas, courtesy of our generous partners: Proud Mary Coffee and Starward Whisky. The conversations continued on the next day at our sold-out Masterclass in partnership with Kearney Group. Along the riverside of Federation Square, a group of dedicated folks dived deeper into what it means to mindfully pioneer in the new year. And now, the butterflies, snowballs and ripples* are already having their effect. Post-Percolate, people are changed, and living out 2017 carpe-annum-style°. * All our favourite visual metaphors for change. ° Carpe diem, carpe annum. Taking ichi-go ichi-e into account, and pending access to time travel, no amount of glorious and figurative descriptions could do Percolate any justice. But! Rather than linger in nostalgia or FOMO for Percolate having been and gone, let’s be jolly together once more, and re-live some of the post-event highlights. A vignette captured by Cloakroom Media, backed with a live recording of the suave vocals of artisan thinker Mykel Dixon and his accompanying jazz band. Floor-to-ceiling Bromley-art walls were the backdrop to Caitlin, one of the baristas from Proud Mary. They lured us nose-first into the coffee cul-de-sac corner of the venue, filling it with the wafting aromas of fresh coffee. Batch brews were served throughout the afternoon at the generous ad lib frequency. Coffee beans produced by Nahun Fernandez from Santa Barbara, Honduras. You can help yourself to them again by visiting Proud Mary or Aunty Pegs (the surrogate office of The Cleverness) or buying them online here. "The Best Coffee I Have Ever Experienced In The World is from this place." said one Dr Jason Fox. Not everyone was greeted mid-LOL, but what everyone did get upon greeting was an unexplained, mystery kraft envelope offered by a pair of outstretched hands from one of the above. A steady stream of friends, colleagues and collaborators came to collect what we had spent months in the prepping. 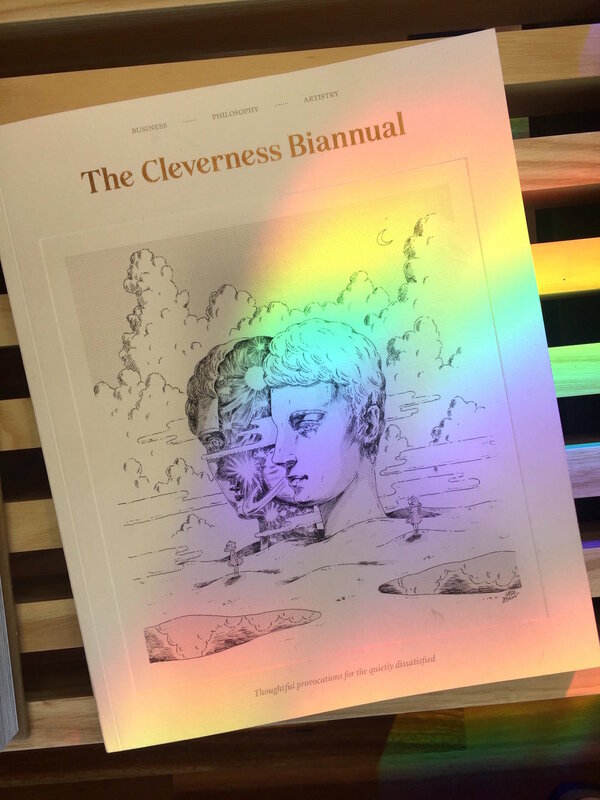 …the weightiest item of them all: the inaugural Issue Ø of The Cleverness Biannual, our independent print magazine. It smelled less than a few hours old because it was only a few hours old—freshly arrived from Morgan Printing in Sydney. The book-smell, paperstock and newness induced physical and visible pauses. And so, the silken drapes of our 7-month-long secret project have been flung! Here’s a virtual flick-through. Inside it: thoughtful provocations for the quietly dissatisfied, with rich insights exploring the theme 'clarity/ambiguity' across business, artistry and philosophy. Dr Jason Fox, Head of The Cleverness and conversation-facilitator for Percolate, broke in the stage in his usual fashion—exuding dapperly flair, debonair and red hair. Here he is seen harnessing the unique power from within his right elbow, and scattering his wit about the room via invisible digital beams at each fingertip. Jason skilfully set the context for the day, laying down the scaffold for the tapestry of themes that he would later be weaving together. An intimate, broody mood was conjured to host pivotal questions such as: how do we not get too busy for meaningful progress? To assist in this joint contemplation, tweets were discouraged. Jason interviewed Mike Sullivan, green coffee buyer of Proud Mary. We don’t say this lightly—Proud Mary are pioneers in specialty coffee and are constantly exploring new territory and experimenting at the edge of coffee roasting and tasting. Enjoying a hot-in-hand cup of geisha on stage, Mike shared the backstory of every Proud Mary coffee cup: the hard work and dedication of the producers and communities that make them. Proud Mary actively and proudly support these ‘true rockstars of coffee’. Sandwiched between a layer of levitating moss balls above, and a sea of great minds below, our sagely yet humble speakers had the hefty task of filling the space in between. 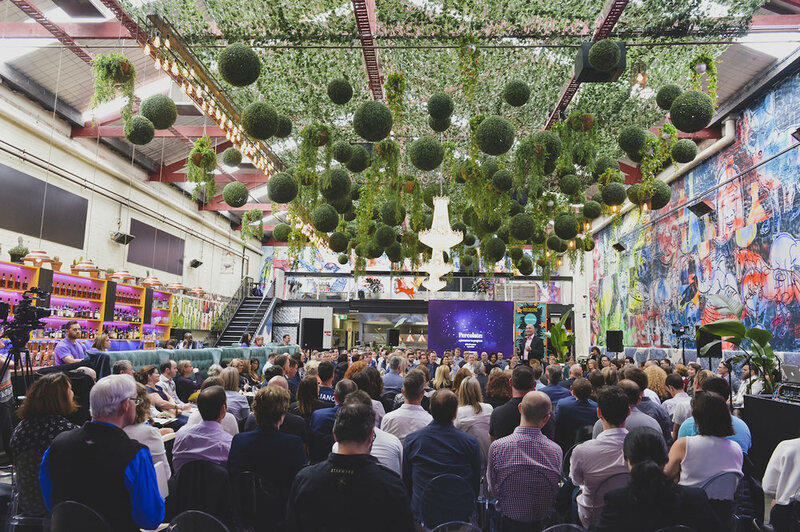 And they delivered the opposite of polished, pithy presentations…instead, bringing raw perspectives from their unique thought leadership domain. Specifically: how they personally approached navigating through complexity and ambiguity. We knew there were going to be myriad angles and interpretations to this. The diversity of approaches and topics blew us all away. Oscar Trimboli — Executive Coach & Author: on deeper listening, and the gift of silence. Helen Souness — Managing Director, Etsy Australia & Asia: on moving closer towards a multi-dimensional purpose, rather than finding your one true calling. Rohan Gunatillake — Founder of Mindfulness Everywhere & Creator of Buddhify: on mindfulness being nothing personal. Sean Fabri — Improviser & Doctor: on imagining others complexly, which increases empathy. Josi Heyerdahl — Partnerships Manager, World Wildlife Fund: on protecting nature with business. Natasha Pincus — Director and Filmmaker: on the practice of tapping into your inner genius. Will Dayble — Founder, Squareweave & Fitzroy Academy: on testing our values and decisions, with the prospect of living on Mars. Each gifted us with a question at the end of their talk. Plenty of unedited banter came out of our Percolate rolling panel session, starring both speakers and audience members alike. We enjoyed a diverse, interactive, rotating panel of un-likeminded individuals— a great combo for stirring up conversation of the sparring-sort. Thoughtful thinking faces. This is what collective contemplation looks like. Ideas delivered in unison, contemplated in unison, but interpreted and to be re-used in infinite ways. A moment of hypergraphia, capturing one fleeting thought and joining others. Set on his own stage, Mykel Dixon was our in-house artisan thinker, atmospheric designer and lead jazz musician for the day, accompanied by a 3-piece band. Mykel authored Just Do 5omething, a book for unlocking the creative mavericks. This guys is a legend, and his perspective is exactly what the world needs. What better way to further access a deeply contemplative state than with internationally award-winning whisky. Starward whisky drams came octagonally arranged on platters, to be served one by one to each person in the audience. Heads turned as the sound of gently chinking glass came to a slow rise, and then fall, as each glass became held in hand. Rich ambers whirled notes of caramel and fruit into the air. 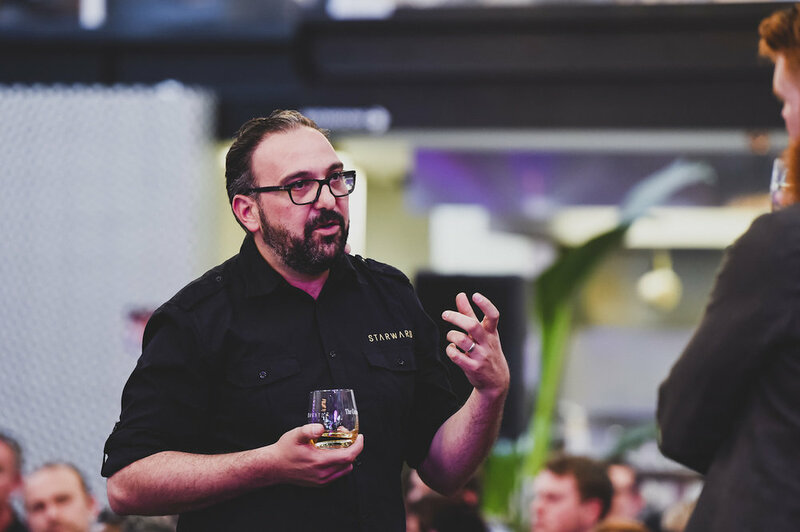 We invited David Vitale to the stage—the pioneering and visionary founder behind the internationally award-winning craft whisky company, Starward. It's the only truly Australian whisky in the world: made from Australian barley and aged in Australian wine barrels, admidst a (Melbourne) Australian climate. It was easy to become enraptured and enamoured by David’s extremely humble, personable and softly spoken manner. We were all quiet, deep listeners as David guided us through a mindful whisky tasting experience. Half of us leaned in and forward in our seats to better engage in every note, while half of us leaned back, in calm and contemplative repose. David shares our passion for quality conversations, and the type of conversation that a good whisky opens up. For everyone to take home: The Cleverness x Starward glass tumbler. A toast! 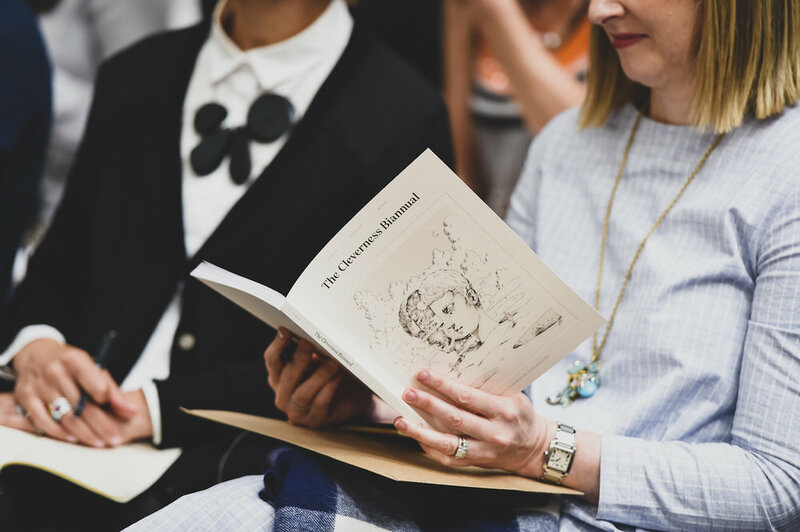 To quality thinking, the launch of The Cleverness Biannual, and the counter-conventional conversations that follow. And there you have it, the recipe for Percolate, summed up in these ingredients: People + Coffee + Jazz + Provocations + Questions + Whisky + Magazine + Time.